Laura signing in for Joyce. I’ve never written on someone else’s blog before, so this is a little weird! There’s a first time for everything, right? 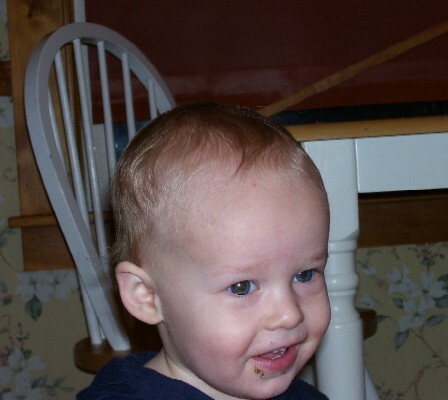 Little intro on me, just in case you haven’t been reading my mom’s blogroll: I’m 22, live in Vermont and am mom to Joyce’s first grandson (pictured above). We had high winds here and the whole area serviced by Puget Sound Energy is having difficulties with their electricity. The recording said that they are waiting for the winds to die down before they send out the repair men to survey damage. So for the time being my family and I are enjoying candle lit reading and the heat generated by our wood burning fireplace. Rick hasn’t been able to do any work due to the lack of power, nor have I been able to write emails or blog. We’re hoping that soon we’ll have our lights and electricity back so that we can get back to life as usual. I remember the days when my mom insisted that she felt better having a book in her hand to read, and a journal to write in, should she feel compelled to record personal thoughts. A good book is always welcome to her, she’ll pick up almost anything recommended to her, and I believe she does own a journal. However, she has discovered how wonderful a thing it is to find kindred spirits (as Anne of Green Gables would say!) in people on the Internet who you would otherwise never meet. Can you be in the contest even if you didn’t join the first of November? Hopefully my mom will be back tomorrow. They’ve been out of power since 9am or so this morning. Must be a wacko hair day for everyone! I recall strongly disliking the days when you can only moderate your reflection in the mirror by candle light. It’s nice though that everyone around is in the same straights, makes for laughs rather than exclusive embarrassment.